Catholic Charities celebrated the spirit of charity at its annual Caritas dinner, held at the Granview Restaurant on October 24. The dinner honors individuals and groups who have made contributions to serving individuals and families most affected by poverty throughout the Diocese of Ogdensburg. Those present at this year’s dinner, including the corporation board, trustees, funding partners, staff and service recipients, were treated to the sounds of the “Lighthouse Blues Band“ before Father Arthur J. LaBaff, Catholic Charities Corporation Board president, introduced Deacon Thomas J. Yousey, who delivered the dinner invocation. Deacon Patrick Donahue, Catholic Charities’ executive director, recognized Melody Ransom of the Malone Catholic Charities Office and Eileen Premo of Seaway Catholic Charities for staff longevity and outstanding service. Deacon Donahue also addressed those present about the changing face of poverty in the North Country. 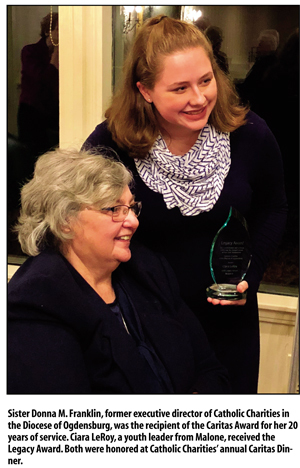 Bishop Terry R. LaValley presented awards to two individuals who have made major contributions to the mission of Catholic Charities and the Diocese of Ogdensburg. Sister Donna M. Franklin, the agency’s former executive director, was the recipient of the Caritas Award for her 20 years of commitment and dedication to serving the poor throughout the diocese. Bishop LaValley commended all those present for their continued efforts to effectively and compassionately address the needs of the underserved and the marginalized throughout the Diocese of Ogdensburg.